Synopsis: Cas Lowood has inherited an unusual vocation: He kills the dead. For months, I’ve heard so many fantastic things about this book, I couldn’t wait to read it. I was a bit nervous because I heard it was really scary, and I’m a total wuss when it comes to scary stuff. It’s very rare that I read scary books, and I hardly ever see scary movies, because my imagination is way too overactive, especially when it comes to ghosts - vampires, werewolves, zombies, and other supernatural beings don’t generally scare me because I don’t believe they’re real, but I know ghosts are real, so they freak me out. But every once in awhile, I enjoy that adrenaline rush you get from reading something scary, so I was really looking forward to this book. For me personally, Anna Dressed in Blood didn’t live up to the hype. I’m not going to say I was disappointed, because it was a very good book, but I wasn’t scared at all. It was exciting and suspenseful, but scary? Not even a little bit, not for me, anyway. I’d say it was more grotesque than anything. Maybe I’ve just become too desensitized? The descriptions were fantastic and creepy and sometimes shocking, but I was more fascinated than afraid. All that being said, I thought it was a refreshingly unique story, and even though I wasn’t scared, it was suspenseful enough that I read it in 24 hours (which is pretty good for me because I’m a slow reader), and I snarked at anyone who distracted me because I wanted to know what was going to happen. I loved that it was told from a guy’s perspective, and Cas was a great character. I also enjoyed the secondary characters, and watching Cas let down his guard around them and accept that they were in his life for better or worse. A nice unexpected surprise was the fact that there were moments in this book that were laugh-out-loud funny. There was a lot of very clever dialogue, and Cas had this very frank way of thinking/speaking that was often amusing. Since this book is going toward the 2012 Witches and Witchcraft Reading Challenge, I just want to touch on the witchcraft aspect of the story. Cas’s mom, along with his new friend Thomas, and Thomas’s grandfather were all witches. I loved that it was realistic, actual magic, and not hocus pocus magic. It always bothers me when people clearly know nothing about real witchcraft and get a bunch of facts wrong, or make light of it. Magic can be scary, powerful stuff, and I appreciated that it wasn’t taken lightly in this book. And lastly, on a slightly random note, I loved that it was set in Thunder Bay, Ontario. I’ve never been that far north, but I live in southeastern Ontario, and it always excites me to find a book set in Canada. 2012 New Authors Reading Challenge, 2012 Witches & Witchcraft Reading Challenge. See my progress in these and other challenges here. 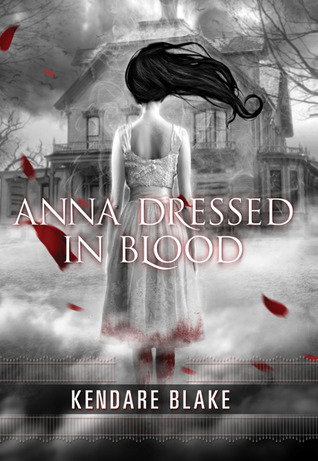 Now I’m curious: have you read Anna Dressed in Blood? What did you think? Were you scared? Did it live up to the hype for you, or fall short? I want to hear your opinions! I wasn't scared either it was more fun than anything else! :) Great review Marie! Oh, and for something scary, I really loved The Deepest Cut by JA Templeton! I've wanted to read this since before it came out, but haven't yet. I am making it a priority in February to finally read it. Have you read Dark Inside by Jeyn Roberts? You Must, if you haven't yet. Creeeeepy. I haven't read this yet, but you've just given me a whole pile of reasons to pick it up the next time I do a book shopping spree. :) This sounds absolutely great and like it should be a refreshing change from what I normally read, which is something I probably need right now. Great review! I'm disappointed to hear that it's not as scary as everyone has been saying! I love scaring myself. xD Great review! I think I'll still read this one. This is in my TBR pile...unless it is Stephen King ..the Stand and IT kind of scary ..i usually don't scare either..but I am glad that you enjoyed the suspense and mystery of it. I want to read it now I saw your review of it.